Here's Charlie Grant in the pilot's section of a glider he designed and flew back in 1912 at the age of 17. That was at Peru, Vermont. Flights ranged up to 350 feet at 25-foot altitude, taking off from a small hill. Improvements to the glider were added later that year. via email from Mike O'Neal, 4-14-98 Charles Hampson Grant who you may have heard of, was a pilot at Princeton. Grant was the first man to fly in the state of Vermont. 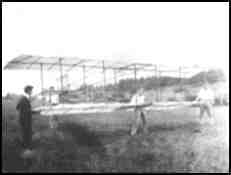 He and his younger brother Duncan built a glider modeled after Pilchers successful designs and flew it in the Summer of 1911. Charlie Grant was then 15 years old. He went to Princeton for his engineering degree, but dropped out before graduating to work for Grover Loening. Grant also designed a fighter plane while at Princeton, but only France showed a mild interest in it. He later went on to help design the Gordon Bennett racers in the 30's - helped design the first practical retractable landing gear and slotted flaps. His brother Duncan was killed in a Sopwith Camel while still in training in England. Charlie was denied a flying commission when he failed the physical. He lost an eardrum to the measles and although he had been flying since he was 15, had shown some talent in the Jenny at Princeton, but was still rejected. Between the wars he established an aviation summer camp for boys called Camp Duncan Grant to teach aeronautics to young enthusiasts, primarily though model building.I interviewed Mr. Grant in 1986 at his home in Vermont, just a couple of miles from the meadow where he flew his glider in 1911. He died just six months later. It's been quite a while since I tossed you an email, but bumped into your site again this morning looking for information about Charles Grant's brother Duncan and, well, found what I had sent along in 1998. I've gathered some more information since then and would like to correct the bit in Charles Grants bio about his brother being killed in a Sopwith Camel. Duncan was assigned to the 148th Aero Squadron initially which would fly the Camel in France, but in May 1918, Duncan was detached and flying with #6 Training Depot Squadron at Boscombe Downs, England. On the 31st of May he was killed in a mid-air collission with another American - Edward Graham Tart. Sometimes listed as a Canadian, but actually from Massachussetts. Both Tart and Grant were flying DeHavilland DH-6's at the time of the accident. I've attached a photo of Duncan. If you need higher resolution, just drop me a line - I have much denser version of this image at hand. I recently acquired a nice collection of photos of the both of them from childhood upward and a neat collection of photos of Charlies early flying models - this shot was among them. Editor's Note: I love to hear from friends and family of the pioneers. The glimpses into their personal lives always are welcome and serve to enrich the stories of their lives. SAM 35 Yearbook No1 published in the UK. The fearlessness with which the pioneer designers of airplanes developed their projects, using the most rudimentary of methods, is amazing. In only a few months, they completed the design, construction and test flights of the planes. If it flew well, it was considered to be a triumph. This was the case for one of those forgotten airplanes that deserves to be better known, as an example of the level of technical skills which had been applied, far ahead of their time. The Dayton-Wright Racer, was conceived as a monoplane with a high-mounted wing for races, It was designed to participate in the Gordon Bennet Race of 1920, one of the older aerial competitions. The company that would build the Racer, counted among its officers Orville Wright, one of the founders of aviation. whose company and signature had prospered during World War I, constructing under license more than 400 Standard trainers J-1 (a version of the famous Curtiss Jenny) and more than 3000 of Havilland DH-4. Once the war had ended, they needed a design that would attract the attention of the world and help the company to recover from the difficult fiscal situation in which they found themselves. From the efforts of the designers Milton Bauman, head of design of the company, Howard " Sunshine " Rineheart and Charles Hampton Grant was born the RB Racer, one of the most advanced designs for its time. 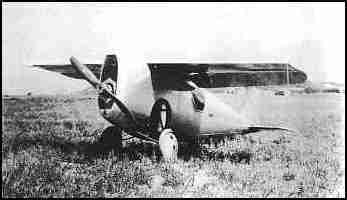 It was a monoplane with a cantilever high-mounted wing, a cabin completely enclosed and a retractable undercarriage. This airplane was unlike anything produced previously, especially when considering the unique operation of the undercarriage that could be lowered or raised manually, the flaps which were adjusted automatically to restrain to the airplane or to help to elevate it, something that also would be utilized several decades later in the Lockheed F-104 Starfighter. Continued Editor's Note: I have translated this portion of a much longer article from the Spanish which is found on the website of Raravia. It is reproduced, along with the accompanying picture, through the courtesy of Fabi�n Capecchi. If you want to read the whole article, and if you who read Spanish, I refer you to the original article. an alternative might be to use the AltaVista translation machine. Charles Hampton Grant, now living in Manchester Center, Vermont, continues his interest in aviation design. It will be recollected that he pioneered the use of flaps and promoted designs for development of more efficient wing surfaces. His development and experimental work continues at his Vermont home. Charlie's work started in 1909 when he experimented with models in aerodynamic efficiency and stability. From 1921 to the present he has concentrated mainly on high-lift devices. His activity in this branch of aviation began when he prescribed and sketched out the flap design and arrangement on the Dayton-Wright Gordon Bennett Racer of 1921, and he has continued in that field of endeavor since. Most recently he has developed a high-lift design which he calls the Grant Verti-Wing, with exceptional test results. based in Crawley, West Sussex, England. by clicking on the Turbulator. You may want to use the "Find" tool on Grant. Charles Grant was a very influential figure in model aviation. He edited Model Airplane News for years. He was determined to put model airplane design on a scientific and mathematical basis and wrote in both the magazine and in a couple of books, that were dense with formulas. Unfortunately much of it was wrong. But none the less he got folks to thinking.